Just Jingle: For Cath (Sans CHA) With Love Blog Hop AND a Brand New Skipping Stones Sketch! For Cath (Sans CHA) With Love Blog Hop AND a Brand New Skipping Stones Sketch! Happy Tuesday, everyone! Today I have TWO events to share with you! I am participating in the Blog Hop for Cath,the Trends Editor for Paper Crafts Magazine and writer of the amazing Moxie Fab World Blog! You see, due to an injury, Cath was unable to attend CHA and that is just cruddy, so she needs some cheering up! We are hear to do that! Cath...consider yourself officially CHEERED!!!! YAY! You can find the entire list of participants at Virginia's blog! AND...because we are also releasing sketch #113 over at Skipping Stones Design this week, I thought I would combine the two and make a cheer up card for Cath using this fabulous sketch! I used the Grunge set and the Always Here set for my fun card! Pam's sketch ROCKED, so I had a lot of fun with this one! While Grunge is a great set for masculine cards, it can TOTALLY go girly, too! I love that! So...check out the sketch challenge and play along for a chance to win some free Skipping Stones stamps! What? I'm the first to comment? Usually there are a million other comments before I even see your posts! This card is soooo pretty!! Cath will love it!! Love the big butterfly and the wood grain textures! Really pretty. Love the double bows, and the colors! Super sweet card! 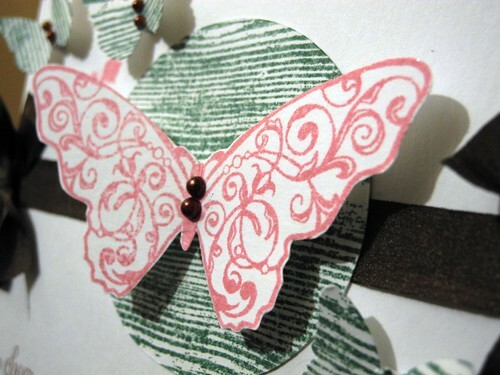 Love those trendy woodgrain butterflies and the ink splotches! Thanks so much for hopping with us, Jennifer! Fun & grungy and girly :) Love it! And what a great idea to cheer Cath up - can't wait to see everyone else's creations! Beautiful card Jingle. It will definitely cheer Cath up. 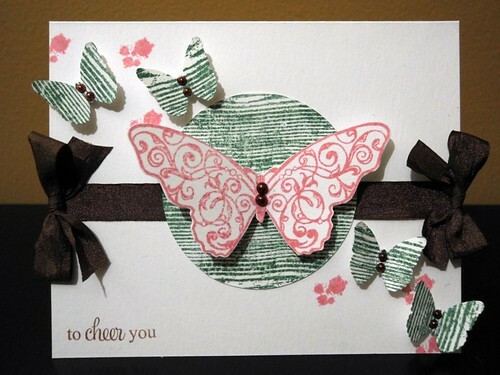 what a pretty card--love all the stamping! What a happy card! Love all of these butterflies. I love the card. I'm a sucker for butterflies. Even though, as you might remember, I hate them in real life. Keep 'em on a card or page and Im happy. Sorry, I meant "girly"! :) Love all the butterflies!!! Love the design Jingle~very striking card, lovely!! and a big cheering on to cath~hoping you are better real soon!!!! Too cute card! Yep, I love butterflies and what they represent. Hope Kath is feeling better soon. Very pretty! Love the woodgrain behind the butterfly! Great card to cheer someone up! Oh Jennifer...this card is beautiful. Butterflies add so much to just anything they land on. This will surely cheer Cath up in no time. Love the grunge + butterflies! Such a lovely card and sentiment for dear Cath! what a great sketch, and I love those butterflies! So pretty! 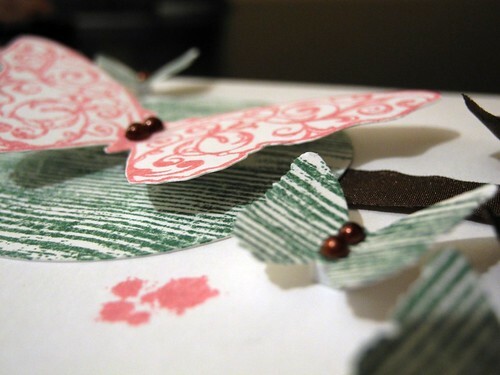 I love the way those butterflies dance across the card! Woodgrain butterflies? Totally awesome. Love this! So what they say is true, you can never go wrong with butterflies! This just looks amazing! Those woodgrain butterflies are soo pretty! Great job! Beautiful card. Love all the butterflies. Jennifer, thank you so much for making this card for me. I just love the butterflies--the colors and the patterns are simply divine! Your card HAS cheered me up, more than I can say. Thank you so much for being such a kind and thoughtful friend. Jingle.......Your card is so, so gorgeous! Love all the texture and the 3-D butterfly.